On April 7, 2018, BRAVO! was screened to an over-flow crowd at Nampa, Idaho’s Warhawk Air Museum. The day began with a bluster but turned off to be beautiful as people from all over Idaho’s Treasure Valley and beyond came out to see the film and participate in the panel discussion that followed. Around five hundred folks showed up and were greeted by the friendly museum staff. A bonus to anyone who came to see the film was a chance to tour the Warhawk’s spacious environs and spend time learning about the warplanes on exhibit and the lives of warriors whose memorabilia has been shared with the museum. Vietnam veterans visit with members of the Eagle chapter of the DAR. Photo courtesy of Betty Rodgers. If you come to Idaho, this is one of the places you might want to visit. The bulk of the exhibits are intensely personal and speak to the visitors about the men and women who have put their lives on the line for something they believe in, their country. Besides the exhibits, the Warhawk is instrumental in working with schools to ensure that the military history of America gets taught. They are also involved in Honor Flights for World War II vets to visit Washington DC. An additional asset they provide the community is interviewing veterans on video. The finished products are sent to the Library of Congress as well as the interviewees. The Warhawk schedules a wide variety of special events as well as a monthly Kilroy Coffee Klatch on the first Tuesday of every month where guest speakers present programs of interest. The Klatch is free to veterans. 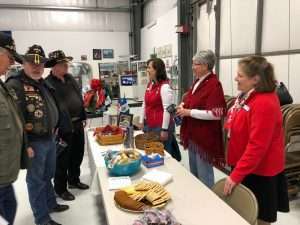 At the screening, the Eagle, Idaho, chapter of the Daughters or the American Revolution provided snacks and water, and the Boise Police Department’s Honor Guard sang the National Anthem à capella. Boise Police Department Honor Guard singing the National Anthem. Photo courtesy of Betty Rodgers. As always, when large groups of people gather to view BRAVO!, the combined empathy in the facility was palpable. And the emotional power emanating from the crowd poured over into the discussion afterwards. On hand to talk about the Siege of Khe Sanh were BRAVO! Marine Ron Rees who came over with his family from the La Grande, Oregon area, Dennis Ross, also from eastern Oregon who flew B-52s over the battlefield of Khe Sanh, Dave Crosby, a flight engineer on C-130s that came in several times a day to keep us supplied with ammo, chow and mail, and Phil Nuchereno, who served with Golf Company, 2nd Battalion, 26th Marines at Khe Sanh during the Siege. BRAVO! co-producer and co-director Ken Rodgers was also on the panel. The audience heard some different points of view from what normally arises in these panel discussions following screenings of BRAVO!. Besides hearing about the men trapped in the combat base, we heard from men who flew bombing missions to beat back the NVA and men who made the dangerous journeys into the base to keep the warriors of Khe Sanh stocked with the necessities of surviving a siege and men who were outside the base, on the hills, running patrols to interdict NVA forces moving to overrun the base. One of the surprises of the day happened right after the screening and before the panel discussion when we asked everyone who had been at Khe Sanh to come forward for a group photo. Five additional men who had served with the Army and the Marines came forward and we got to meet some new friends. 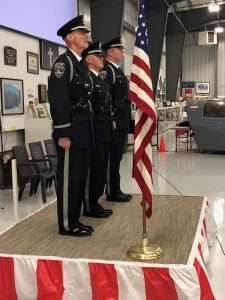 A big thanks to the Warhawk Air Museum’s John and Sue Paul, Colonel Pat Kilroy, Heather Mullins and the crew of efficient, personable volunteers who made this event one of the big milestones in BRAVO!’s history of film screenings. Thanks too, to veteran Frank Turner who came up with the original idea to screen the event to commemorate the Siege of Khe Sanh after fifty years. Mike Shipman of Blue Planet Photography shot photos for the event. Mike has been a stout supporter of BRAVO! from the beginning. So here’s a shout out to Mike and you can find out more about his work here. 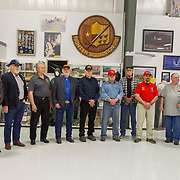 Some of the Khe Sanh veterans who attended the screening at the Warhawk Air Museum. Photo courtesy of Mike Shipman/Blue Planet Photography. Thanks also to Barbara Grant and the caring members of the DAR for their unsung work providing repast to our audience. We would also like to thank KTVB Channel 7 for enthusiastically getting the word out, and the Idaho Division of Veterans Services for helping sponsor the event. Screenings like this are one way we keep the discussion rolling forward about what war and its aftermath is really like and as a way to recognize our military veterans. You can find out more about the Warhawk Air Museum and all they do for veterans and the community at large here. BRAVO! is now available in digital form on Amazon Prime. Please check it out if you are interested, and please consider sharing this news with your friends and contacts whom you think might be interested in seeing the film. And please ask them to give us a review if they would. It will help get the film out to a broader audience. This link will take you directly to BRAVO!’s Amazon Prime site where you can take a look at the options for streaming. At 3:00 PM on May 27, 2018, BRAVO! will be screened in Paris, TN at the Krider Performing Arts Center. You can find out more about this event and the Krider Performance Art Center here.